Well, to start this off, I guess it makes sense to begin with my ongoing volunteer work with Big Brothers Big Sisters of Southern Maine. BBBS is located off Lancaster Street in Portland. Feeling a little antsy on a warm summer day last year, I trucked myself down to their office to figure out what being a “Big Sis” is all about. The application process was a little lengthy, but not enough to turn me off. I’ll admit to being a little worried by the orientation quiz, which implied that all the littles in their program are out-of-control freaks. But, I was up for a challenge, so why not? BBBS requires a pretty high level of commitment – I am expected to meet with my little every week for 3-5 hours, and to carry this out for at least a year. I’m also supposed to check-in with a BBBS staff member every month to update them on how the relationship is developing. The first time I met K. I knew that volunteering my time to act as her mentor would be a piece of cake. The kid was about to turn twelve and looked at me with glowing eyes – it was like I was the best birthday present she could ask for. Our first outing was to the YMCA – we get free passes through BBBS. Hoping for a couple hours in the pool, we excitedly approached the check-in desk, only to find out that the pool was unexpectedly closed for the day. K. took it all in stride as we ended up in the i-pool, practically crowded out by unruly kids from summer camp. We ended up leaving early and getting ice cream at Wild Burritos – obviously neither of us could complain. Over the past few months, K. and I have managed to get together about every other week for an outing. I can’t say enough good things about her. But, I haven’t been particularly impressed by BBBS. In the first few months, I made an attempt to check-in on a regular basis, but my phone calls weren’t returned for weeks. A good friend (well, ex-boyfriend, really) tried to sign up as well, but never heard anything after what he thought was a successful interview. And, my other complaint is that there is relatively little support for low-budget outings. I mean, K. and I are pretty good about finding cheap or free things to do, but spending time together nearly every week gets expensive (and I always carry the cost). 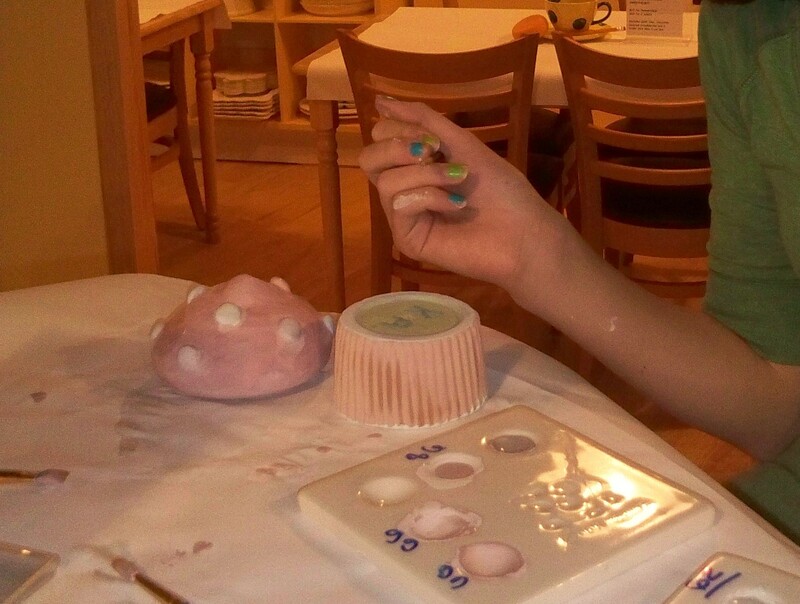 Our most recent night out was painting pottery at Color Me Mine – $30 and three hours later, we were happy owners of a cupcake box and small plate. Not exactly a cheap date, but I can’t think of another way I’d rather spend a Friday night.